Aside from coconut oil, the new thing I’m going gaga over are chia seeds. Yup, they’re the same chia seeds from the ever-popular Chia-Pet. Ch-ch-ch-Chia seeds are native to Central and South America and long before we were spreading the seeds on textured terracotta pots shaped like dogs and cats, Mayan and Aztec warriors made better use of the superfood- it was an important part of their diet. These seeds support heart health, provide energy and protein and have anti-inflammatory properties. These super seeds have 8 times the omega-3 than that of wild Atlantic salmon, 5 times more calcium than milk, and more antioxidants than blueberries. Seriously, these little guys have a lot going for them. Not only are they basically the superfood MVP’s, but unlike flax seeds, which are also considered a superfood, you don’t have to do ground them to reap all their benefits. You can sprinkle a teaspoon of them into a bowl of cereal or even into that fresh juice you’ve extracted. The possibilities are endless. Once they are hydrated they become thick and have a gel-like tapioca consistency. 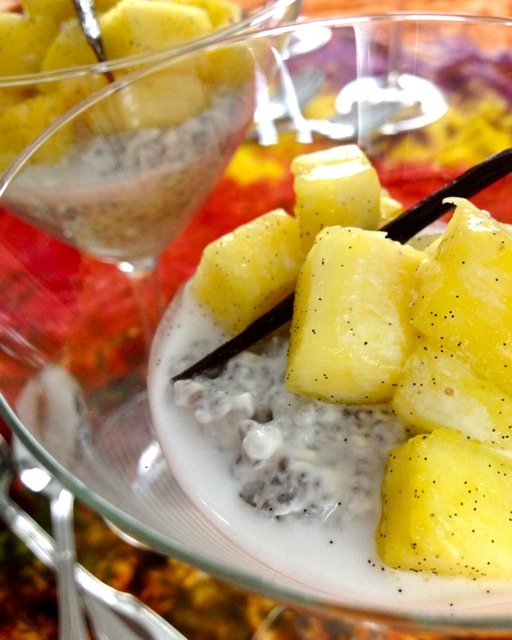 They are perfect for a no-cook dessert, like in this recipe, which I call Chia-Coladas. These are sweetened with honey and flavored with rich, creamy coconut milk, vanilla seeds and topped with fresh pineapples. Combine the coconut milk, yogurt, chia seeds, honey and most of the vanilla seeds, in a small-sized mixing bowl and whisk together with a fork until chia seeds are moistened with the coconut milk mixture. Cover and refrigerate for a minimum of 4 hours, or until the mixture has thickened and the chia seeds have softened. Meanwhile, add the remaining bit of vanilla seeds along with the pineapple in another small mixing bowl and refrigerate until ready for serving. To serve, divide the chia seed mixture into 4 martini glasses. Then, divide the pineapple mixture into the glasses. Top with extra coconut milk if desired. Enjoy chilled. Sounds yummy,; my partner eats dairy free. Any substitutions for yoghurt ? Hello! Thanks so much for visiting. A good friend of mine, who also eats dairy free, was just telling me that she was going to make this with soy yoghurt. I think soy milk would also be an appropriate substitution. Let me know how it goes. Thanks again! This is amazing! I usually just mix my chia with raw cocao, and almond milk, but this, THIS is AMAZING!!! Hi Miranda. Thanks so much. I haven’t tried chia with cocao yet, but it’s on my radar. What do you use as a sweetener?